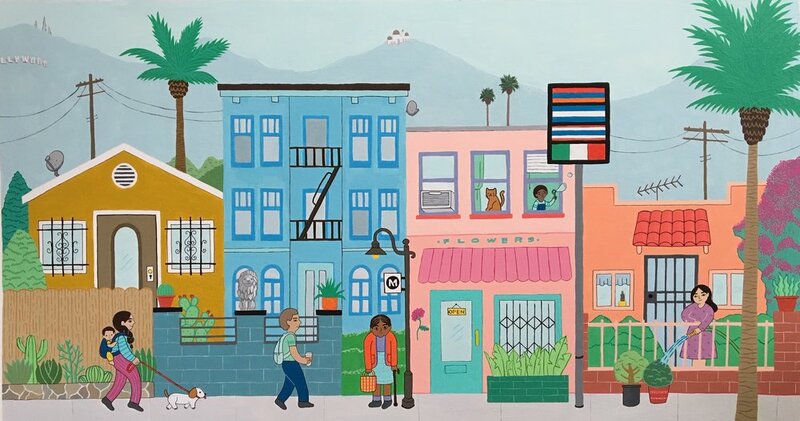 I’m excited to announce I was recently commissioned by Metro to create an artwork inspired by East Hollywood as part of their Through The Eyes of Artists poster series. I recently sat down with Vania Vananina as a guest on her podcast where she talks to creatives about their process and life as a creative. I had a great time talking about my inspiration and process. The episode is out now and you can find it on iTunes, Google Podcasts, Public Radio and Spotify. Click HERE to find the episode on iTunes. My piece “Orange House #2” is currently on display in Long Beach, CA at MoLAA, read about the exhibition below. I’m excited to have a new piece included in this group exhibition. 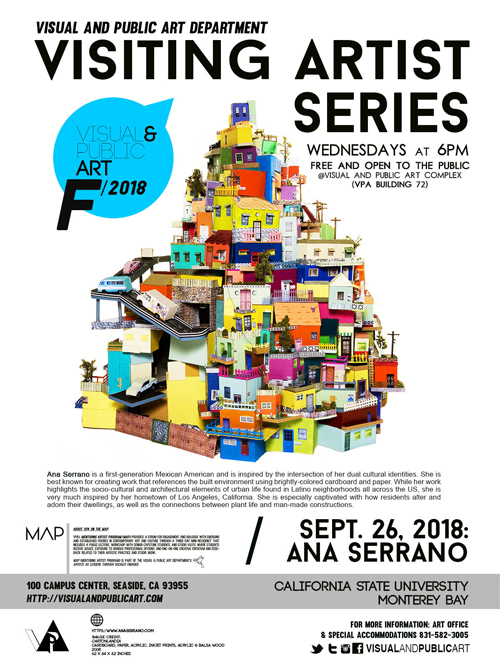 About the exhibition: 35x35: Dual Vision is an annual group exhibition held at the Mexican Center for Culture and Cinematic Arts featuring works by 35 LA-based Mexican and Mexican American writers, musicians and visual artist who are under the age of 35. The purpose of this annual exhibition is to show the diversity of talent in the Mexican American community while also creating connections between the artist. Dual Vision refers to Du Bois' concept of double consciousness, the internal conflict experienced by subordinated groups in an oppressive society. In this case, the double consciousness is exemplified in the contention between opposing identity: Mexican and American. Very honored and excited to be a visiting artist at Cal State University Monterey Bay. My visit includes an artist talk, a workshop on demystifying what it mean to be a working artist and a portfolio review of senior students. The artist talk is open to the public- Sept 26th, 6-8 pm at CSUMB, Building 72. My piece Cartonlandia along with a few others will be traveling to Mexico City to be part of this landmark exhibition. About the Exhibition: "Featuring the works of nearly 30 Los Angeles-based artists, the AltaMed Art Collection exhibit “Bridges in Time of Walls” aims to address the many commonalities rooted in the shared history, traditions, and rich appreciation for art, music, and family that exist between those who live in Mexico and those who have emigrated to Los Angeles to set roots in the United States. Join me on Saturday, June 2nd at 1 PM at Pasadena Museum of California Art. Hosted by Gurl Museum Day, I will be leading a tour of my installation and answering any questions. For more info + tickets, click HERE. Read a web version of the article HERE. I will be participating in a talk following the 8pm performance, on Saturday, June 2nd. Pasadena Playhouse has generously extended a 20% off promo code: PMCA, for anyone interested in purchasing tickets. 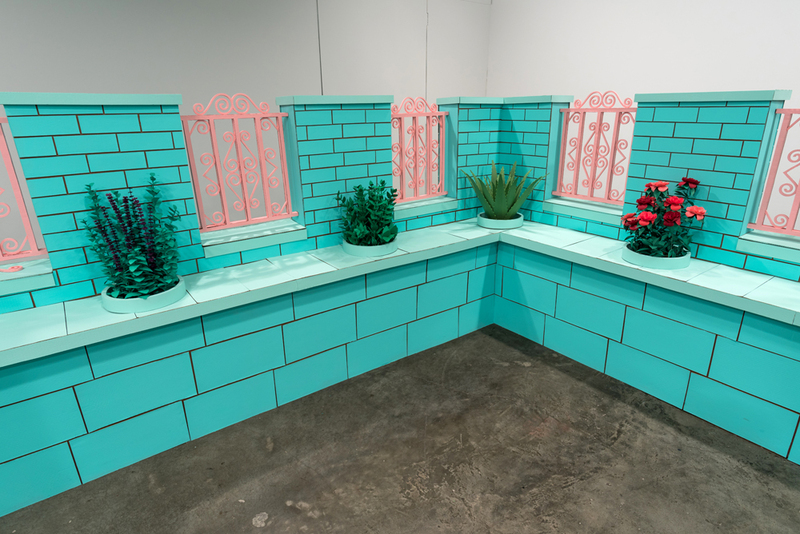 Ana Serrano’s immersive “garden” both references a recognizable urban landscape and pays homage to the artist’s family connection to the land in Mexico. Highlighting the juxtaposition of the built environment and plant life, the installation is composed of bright-colored walls and lively plants made of cardboard and paper. The dynamic space invites viewers to move into the sculpture and immerse themselves in the disparate yet familiar elements of city living, emphasizing the balance between man-made constructions and natural elements as well as dense, permanent objects and those that are lighter, more ephemeral. In Serrano’s installation, plants poke up through the “concrete structure” as they would through cracks in city sidewalks or streets. The plants reference the small plots of dirt found scattered amidst the concrete of Los Angeles, particularly in the Mexican and Mexican-American neighborhoods of Los Angeles where Serrano was raised. With a particular focus on the ways people create gardens and grow food within small spaces, the installation mirrors the garden-within-the-yard of the single-family home and recalls the store fronts and urban environments that provide the soil for family traditions to take root. It focuses on how people bring the natural world into the city environment.